© 2013 S.C. Designs CGS/ Milestone Artworks. All rights reserved. 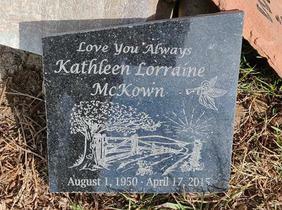 We offer professional Stone Engraving using the method of Sandblasting. We also specialize in; Glass Etching, Wood Engraving, Metal, & Plastic. Your "saying" engraved for life. Awesome! "Engravings are a wonderful way to honor any accomplishment. Hole-in-One, Club Champion, Bowled 300, 200, Being Born, Born Again, Hallelujah!" 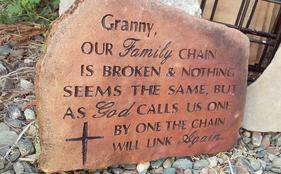 A great Welcoming stone or sign in the front yard, Backyard stones with sayings, memorial stones and so much more! Stone Engraving and Glass Etching in Loomis, Sacramento, Roseville, Rocklin, Carmichael, Fair Oaks, Citrus Heights, Antelope, Granite Bay & More. Milestone Artworks has been providing high-quality products since my friend and business partner Doug Scott started it in 2004. Sadly He passed away a few years ago from lung cancer, he had wanted to leave the business to me and I am very honored to continue the business for him. Every day, we strive to provide you with friendly service and the best quality stone, glass, metal, wood and plastic products in the Sacramento & Placer counties. We have even expanded to the Whole USA and Canada. Lots of companies can sell you stuff and promise to treat you well. 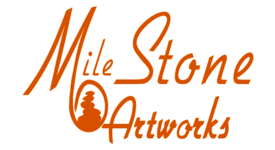 At MileStone Artworks, providing great products and a personalized shopping experience are more than just words…it’s what we do. We only hire the best people who share our passion for what we do, that way, you know you’re being helped by people who know their stuff. “Good enough” is just not an option for us. We genuinely care about our customers and go above and beyond to provide the best customer support. 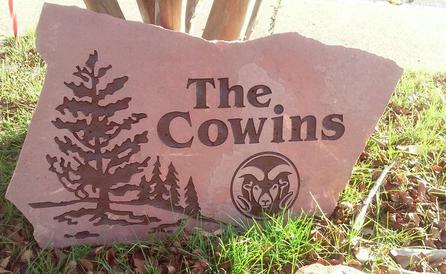 We do these things, and more, while providing you with stone engraving and glass etching at a good value. We hope you are inspired in your own way in life and that our stones can help spiritually, emotionally and be an impact. Got a question or comment? Or just need a Quote. Saving Memories For Life, Love, Happiness & Success! I want to send out some thank you's. 1st to my Friend and past business partner Doug Scott, thanks for showing me so much and helping me out and trusting in me. " RIP". Also To his wife Nancy Scott. Thank you for Believing in me. Also to my Wife Cara, Son Robin and Granna for all your help, My Mom & Second Mom, Dad and Brother, for there support and help as well through life, also a few close Friends along the way. He replied, "If they kept quiet, the stones along the road would burst into cheers!"